After a couple of weeks of crazy events it was about time to celebrate! Wally and I are not really party-people but we sure know how to celebrate with a great breakfast. This is how we did it this morning. Also, Wally and I have finally fixed all our house issues: the house is ours! We are moving in 2 weeks! After all the craziness we went through, we got the house. Or, as Wally says “we are nesting” (I love this English expression!). Instead of emails to write, phone calls to lawyers, bad thoughts against the agent and the seller, we are finally in the happy phase of organizing the move. Yuhuuu! Aaaand...as some of you have noticed, I was even able to post my first challenge for the project food blog competition. Man...that was a hard one! How can you have a loquacious (way too loquacious) Italian limit the story about herself to under 1000 words AND still be relevant?! It was one of the hardest tasks for me but thanks to all of you who took the time and patience to read through it! To celebrate and to give us the energy to start the moving (honestly, who likes moving?! I mean, unpacking is fun, but packing….zzzzzzzz) I decided to treat us with a nice Saturday breakfast. 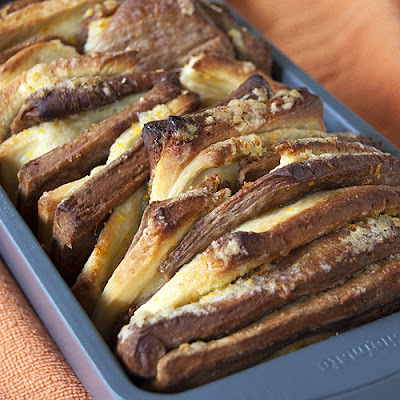 I have bookmarked this amazing recipe of a pull apart bread made by Le Petite Brioche more or less one month ago but still had not tried it [check out her post for more mouthwatering pictures. I decided to make it yesterday afternoon for today’s breakfast. I went back to the original source, a Lemon-Scented Pull-Apart Coffee Cake by Flo Baker but I twisted it a bit. First of all, mine is a “marbled” version of it: one slice of plain bread alternates with one slice of chocolate bread. In this way Wally and I can equally share it: he gets the chocolate bread slices and I get the plain one J and everybody’s happy! Second, I made an orange filling which perfectly complements the chocolate flavor! I also decided to leave out the icing and, honestly, I’m very happy about that decision! Now it’s time for me to go around looking for boxes to pack! I hope you’ll like this recipe. In a big bowl, mix two cups (nine ounces) of flour, the sugar, the yeast, and the salt. In the meantime, in a small bowl combine the milk and the butter and heat in the microwave until the butter is melted. Add the water to the milk mixture and let it rest a minute until just warm. Finally, stir in the vanilla extract. Pour the milk mixture into the flour and mix until the flour is evenly moistened. Beat in the eggs one at a time and continue stirring until well incorporated. Start adding the remaining flour one tablespoon at a time and continue mixing until the dough is smooth, soft, and slightly sticky. Separate the dough into two balls. Lightly flour a work surface and knead one the two until smooth and no longer sticky. Add about two tablespoons of cocoa powder to the remaining dough and again knead it until smooth. Place the two balls of dough into two separate bowls, cover them with plastic wrap, and let them rise in a warm place for 45-60 minutes or until doubled in size. Meanwhile, make the orange sugar filling. Mix the sugar and the orange zest and let it rest so that the sugar will absorb the citrus oils. Center a rack in the oven and preheat the oven to 350F degrees. Grease a 9″x5″ loaf pan. Gently deflate the dough with your hand. Flour a work surface and roll the dough into two rectangles. Use a pastry brush to spread the melted butter evenly over the dough. Use a pizza cutter to cut the dough crosswise in five strips and sprinkle the orange sugar over the first buttered rectangle. Top it with a second rectangle, sprinkling that one with orange sugar as well. 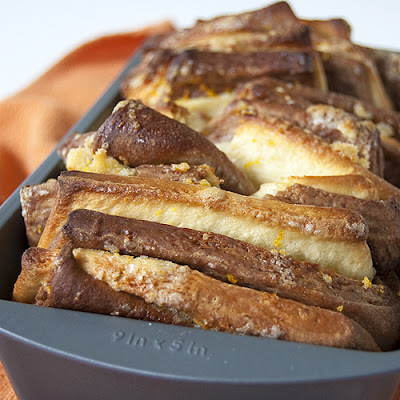 Continue to top with rectangles and sprinkle with the orange sugar, alternating one plain dough rectangle with one chocolate dough rectangle until you have a stack of ten rectangles, all buttered and topped with orange sugar. Now slice this stack of rectangles crosswise, through all ten layers, into 3 or 4 equal rectangles. Carefully transfer these strips of dough into the previously greased the loaf pan, cut edges up, side by side. There might be a lot of room left in the pan but the bread will rise and expand again. Loosely cover the pan with plastic wrap and let the dough rise in a warm place for another 30 to 50 minutes. You may or may not top it with icing but really the orange sugar gives it a wonderful taste by itself. I submitted this recipe to YeastSpotting! Check it out next Friday! That is so cool looking! I like the alternating breads for the same reason as you! Congratulations on getting your dream house! I wish I was close enough to help you pack up. It's always more fun with others helping and chatting. First of all, congratulations on your new house! I'm happy that it finally worked out for you. Second, this loaf is absolutely stunning. I love the two kinds of dough. Hubby is a fan of chocolate and orange, and me not so much. This is perfect! Congrats on the house, what a great great breakfast. We had banana muffins here...well - I did! Somehow I knew you guys were going to like this bread! How not to make everybody's happy with this variety of flavors :) The bread has already gone...the boxes instead are just arriving and crowding my tiny apartment. We need to start little by little cause we are too busy during the week. I don't know how I will cook and bake in the next two weeks...I wish you guys were here AFTER I move, so I would finally have a decent kitchen and a dining table to entertain you all and celebrate! And @Lisa: in Italian we have a more derogative word for loquacious but I did not know how to translate that in English....sure my friends don't always mean it in a nice way but hey the love me for who I am, no matter what! Congrats on the house, I'm so happy for you! That bread has me starving. I really shouldn't be reading this before bed! But I'm thinking in the morning this might be nice! This is a great celebration food :) Congrats on the house! I'm so glad it all worked out for you. Looks amazing! I so need to try this sometime! That looks delicious. Happy celebrating! neat! I KNEW this looked familiar. lol I just made the lemon pull apart bread last week - loved it! What an incredible breakfast treat. The flavors must be fantastic. Congrats with the house purchase and good luck for the impending move! Know exactly what you mean re lawyer's phone calls and emails back & forth to the seller (or in our case developer) - seems like everytime we turn our back another issue pops up! This bread looks awesome! What a great way to start the day. What an interesting and pretty bread! Thanks for sharing and best of luck on the move to the new place.